A view revealing the Flying Pennant pattern on each piece. 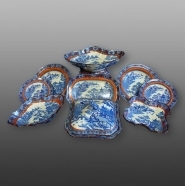 Shown here is a partial dessert set in the Flying Pennant pattern. 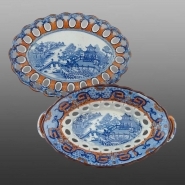 A pearlware pierced basket and stand printed in blue with the Flying Pennant pattern and with red painted overglaze with vermicelli design etched out in white. Brown enameling to the edge.